There is this empty wall in our living room that has been begging me to put something on it, something large but with a slim profile. 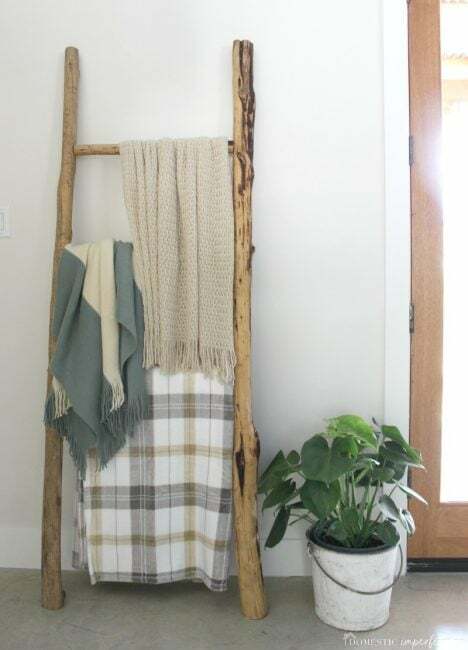 A framed picture would be too small, furniture would be too big, but a wooden blanket ladder….well that would be just right. So I decided to make one myself, and the best part is that is was an easy project that I did for free using branches scrounged up from the yard. using lumber from the hardware store would also be a cheap (and even easier) way to do this. The first step is to hunt down your branches. 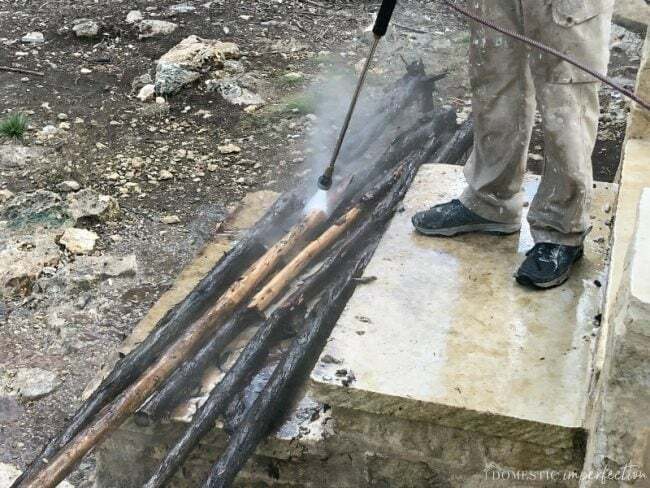 Adam and I are clearing our property (over three years now, it’s the never-ending project) and happen to have cedar branches laying around absolutely everywhere. 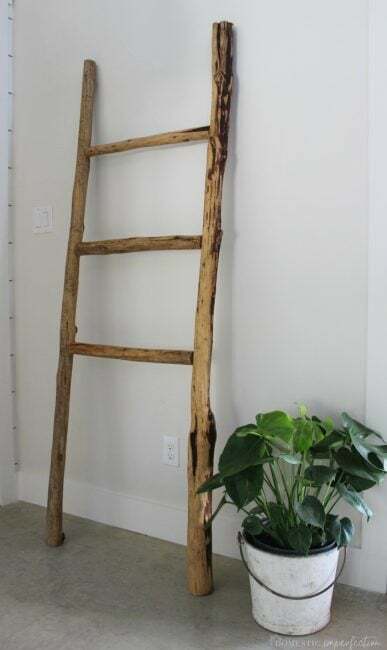 This will obviously be harder for most people, but a great way to get a similar feel would be to use wood from the hardware store for the legs and smaller (easier to find) branches for the rungs. Anyway, after picking our branches my husband had the great idea to pressure wash them to get all the bark off. Next I cut them down to size using a chop saw. 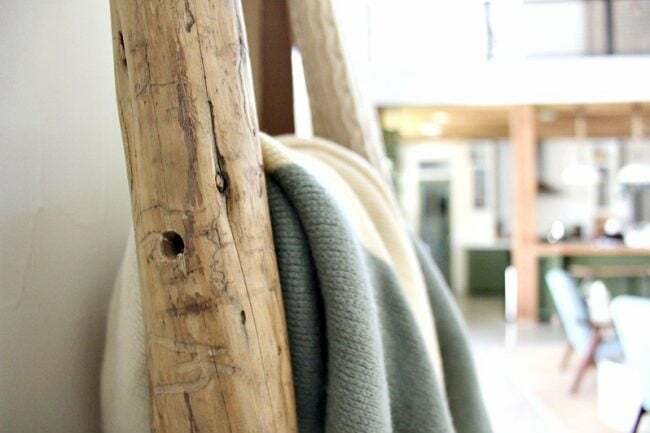 You can take creative liberty with this part and make it any size your heart desires (or space allows). My ladder is kinda huge, the legs are 80 inches and the rungs are 24. 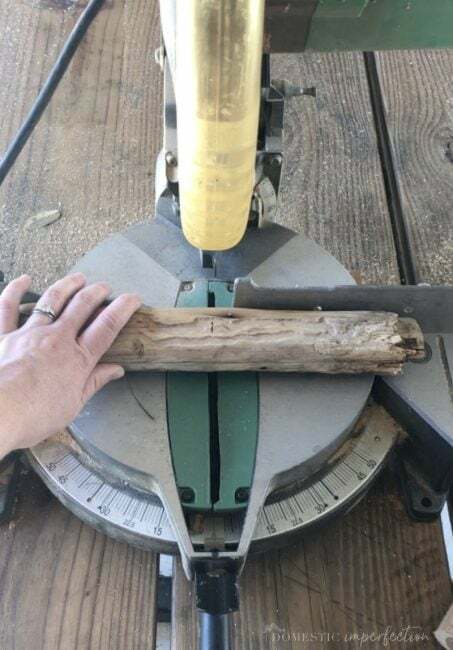 After each branch was cut I used my palm sander to make sure they were smooth and snag free, then used my favorite wood conditioner (Howard Feed-N-Wax) to bring out their natural color. 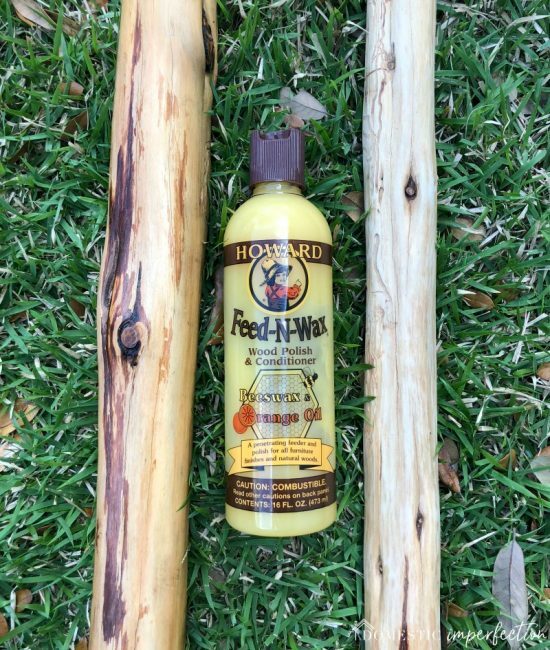 The branch on the left is after the wax, the right one is before. Next came the hardest part, assembly. 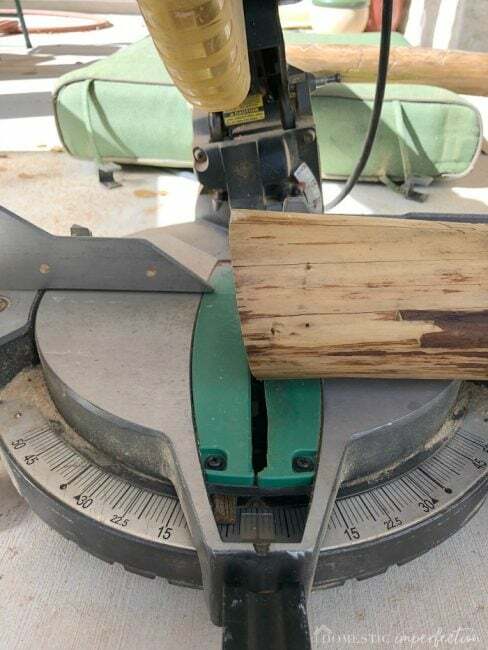 It’s not exactly easy to make a bunch of crooked, bumpy branches into something that is square and level. 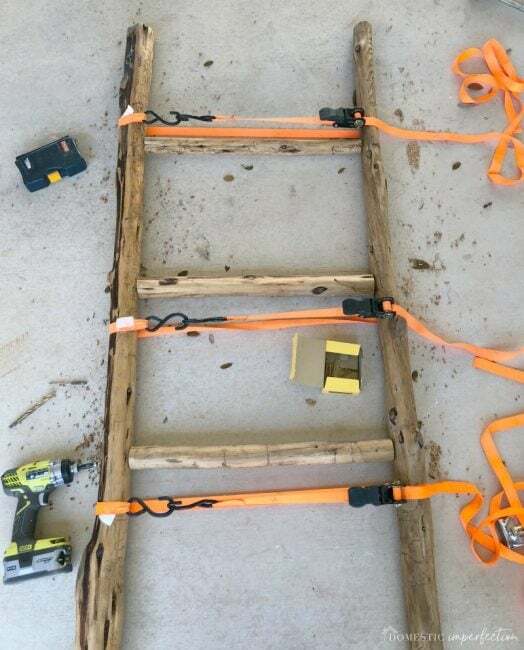 Ideally, you would use a few large clamps to hold everything in place while you try and get the rungs and supports lined up, but none of ours were big enough so rachet straps did the job instead. 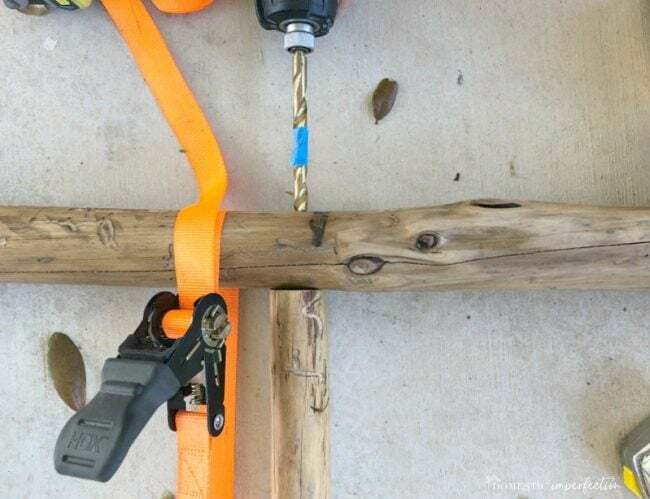 There are a ton of different ways to attach the rungs, ranging from crazy easy (attach the from the front and tie into place) to really not (using fancy expensive tools to make hidden joints). After debating for a while I decided to not spend forever on this project and just use screws to attach them from the outside. You will need to predrill before adding the screw, leaving you with a hole on the outside that gives away your secret. I had planned to fill these and make them invisible, but when it was all said and done the holes didn’t bother me at all, and I left them. After everything was attached I used the chopsaw to put a 10% angle on the feet, which just helps the ladder lean a bit better against the wall. Because of the condition of my branches I was only able to put three rungs on my ladder instead of four, but I think it actually worked out for the best. The fourth rung would have been too low to hang a blanket on, plus this way my toddler and preschooler can’t try and climb it. Before this project none of our blankets were particularly display worthy, they mostly consisted of brightly colored dinosaurs, vehicles, and sports designs (my house is constantly trying to make it’s theme “preschool chic”). So I hopped on Overstock.com and bought three adult throw blankets, and each one is awesome in its own way. Blue and cream stripe – very soft, medium weight, also come in yellow and taupe. Textured ivory – almost like a thick lace and super soft. Really pretty for decorating, comes in 5 colors. 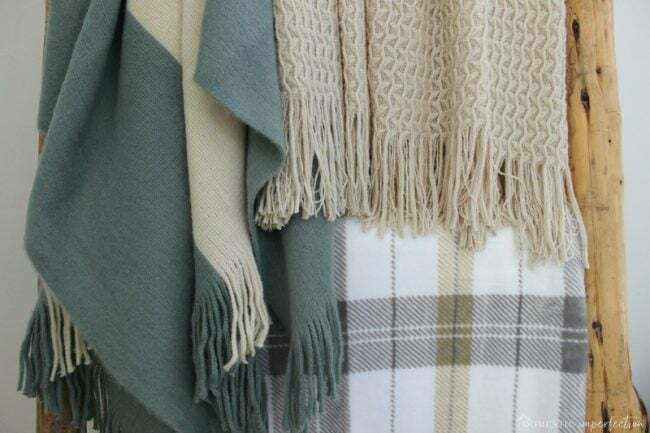 Neutral plaid – crazy soft (are you seeing a theme here? ), comes in bedding sizes. 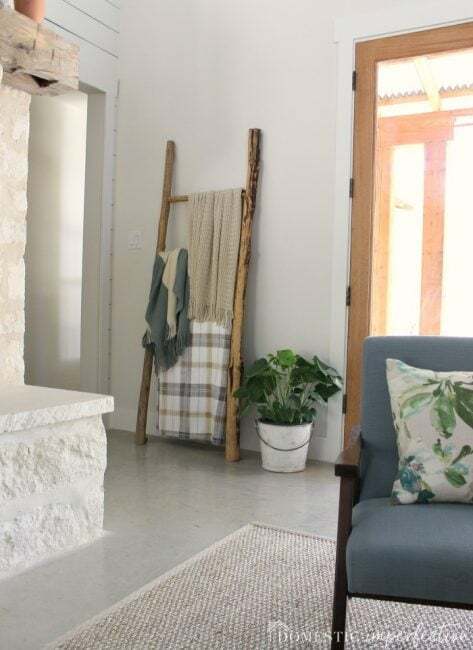 Also, if you’re in the market for a blanket ladder but don’t want to DIY one, here are a few of my favorites from stores online. It looks sooo good! 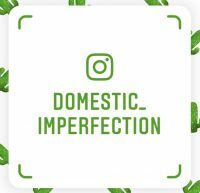 Your house is looking super together in those shots, starting to be styled out and look “done” even with the concrete floors. I can see the design elements are tied together. 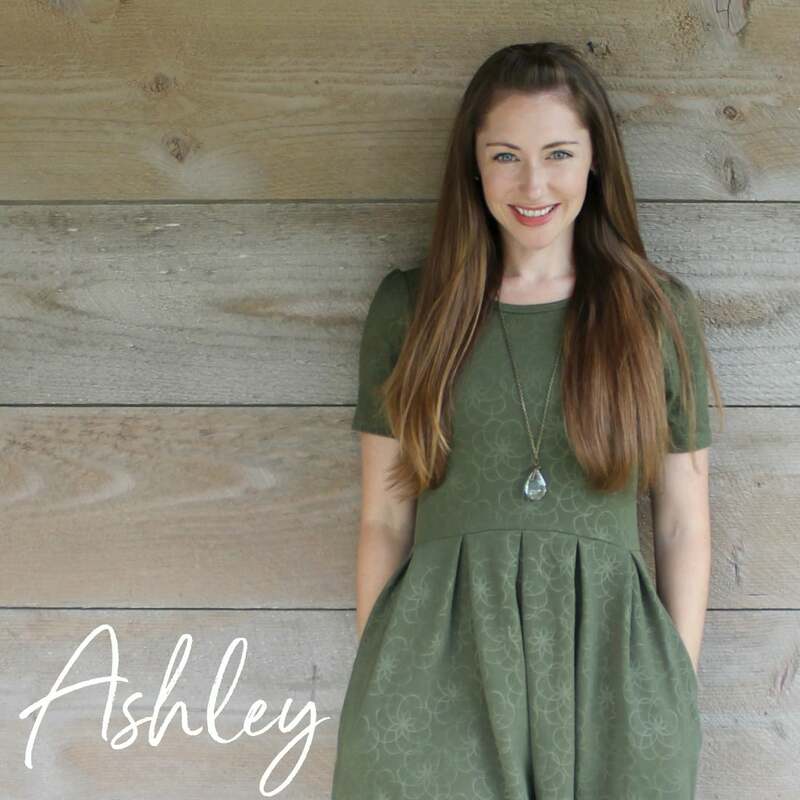 In most of my house I have the opposite problem – so many doors and windows and built ins that there isn’t much room to put art, let alone furniture, on the walls. 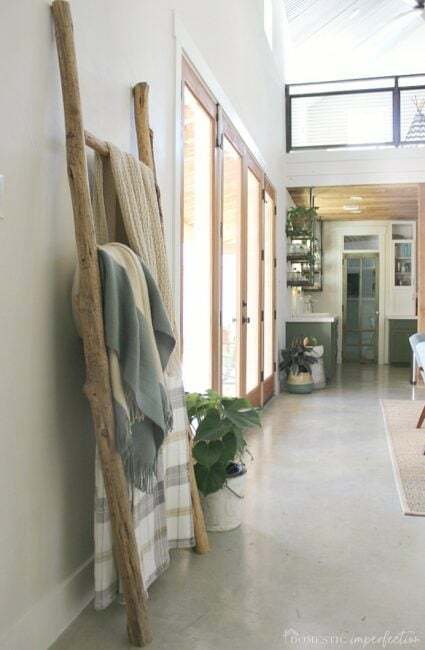 But I do have one awkward corner than I haven’t figured out what to do with yet and I realize that a branch ladder might be quite a possibility! Our last house had literally one tree in its suburban yard but we just moved to the hills and 2 acres of green awesomeness. There is even a pile of 12′ branches the last owners left that, while probably full of snakes, wouldotherwise be ideal to pick through for ladder pieces. Hmmm!